Taken with Olympus E-500 digital camera April 6th 2007. Click image for larger view. 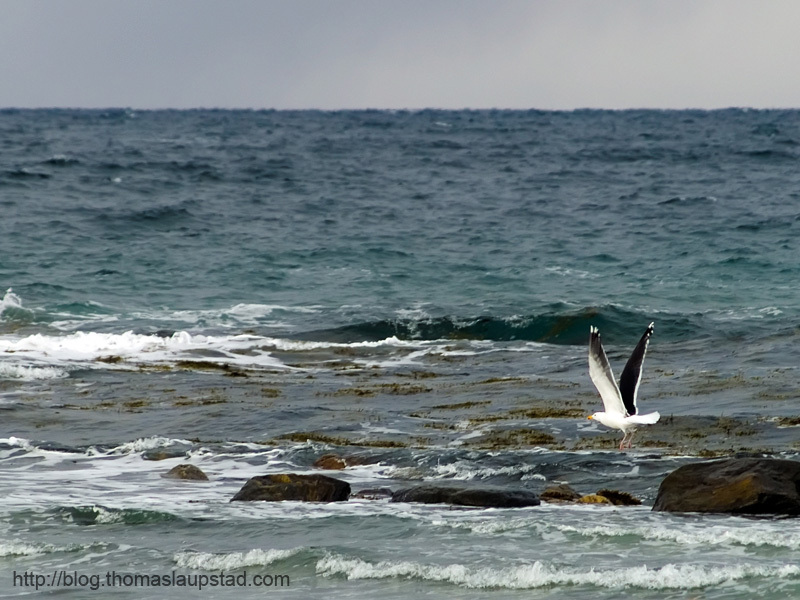 I captured this great black-backed seagull taking flight back in April. Really enjoyed the color and textures of the ocean. In the horizon you can see snow clouds bringing in a blizzard that are so common here in northern Norway when we have winter. Check out this close up photo of the great black-backed seagull if you want to see better what this cool bird looks like. Like the picture? Make a donation to support the site. Looks chilly – reminds me of my triathlon days…. Great shot of the seagull though – his/her wings are almost vertical! Nice capture of the seagull! brrr winter is coming soon to Canada, not looking foward to that lol. Not looking forward to the cold either. Winter have very special light so can be very nice for photography. very interesting. Great pictures and writing.